It cannot just be me! I love spending time in the garden when the sun is out and there’s nothing worse than looking at a stinky, rotting or just plain old boring garden shed. Get the paint out if you can! 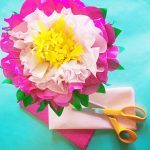 You have the most simple tools to create a huge visual masterpiece! In Need Of Shed Color Ideas?! I have selected some of the most beautiful sheds I’ve been able to find, including some pretty painted sheds that I’ve blogged about previously. 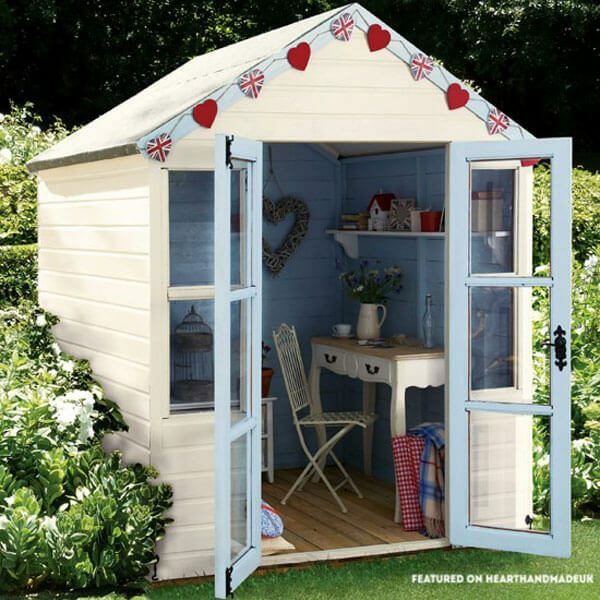 Replacing your garden shed doors with some glass doors and painting the inside could give you a gorgeous work room! The outside would still be a cream shade like this one. Although I would only recommend this if you live in a warm country. You would freeze to death and nobody wants that! Unless you have electricity in there and a little electric heater like this one . Of course, you need to be careful if you go that route! 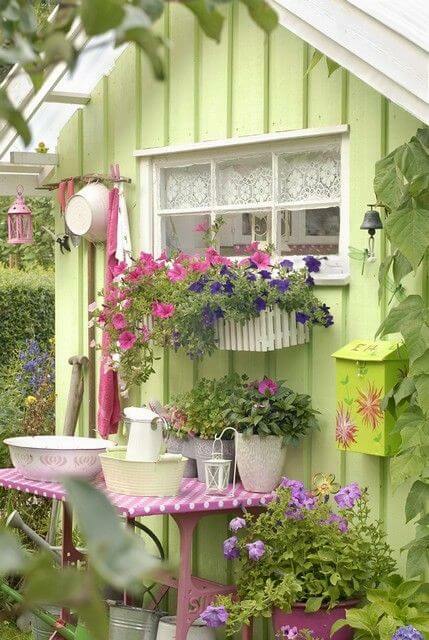 I absolutely love this garden shed and I think it would be fabulous to pay attention to the outside of the shed too. Not to mention this beautiful lace curtain hanging in the windows; such a beautiful contrast to all the bright pinks and greens. How are those for some shed color ideas?! Use a little mail box like this one for storing seeds. Use an upcycled singer sewing table as your potting table. Go crazy and love your garden! 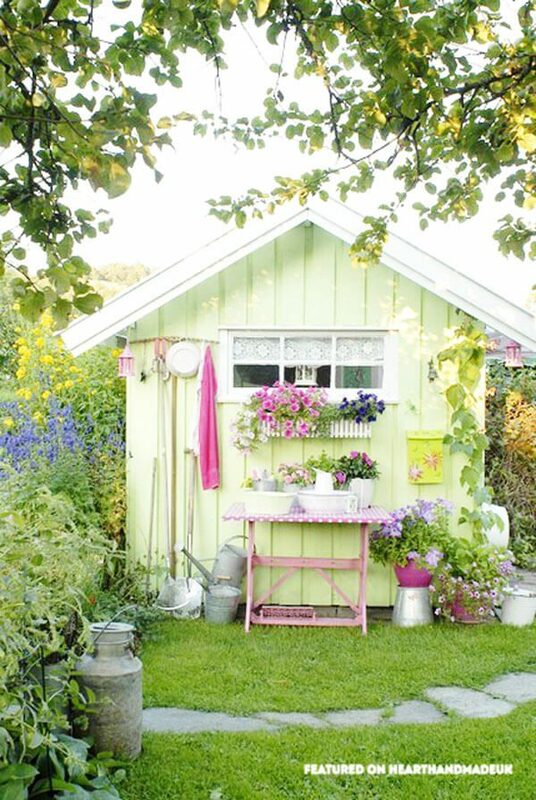 How beautiful is this garden shed?! I would love to sit out here on a warm summer evening. 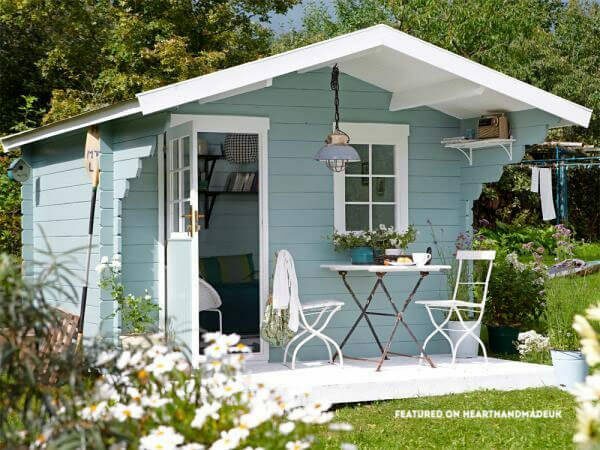 The outside is a gorgeous color and I love the fact that the shed comes with a little porch. 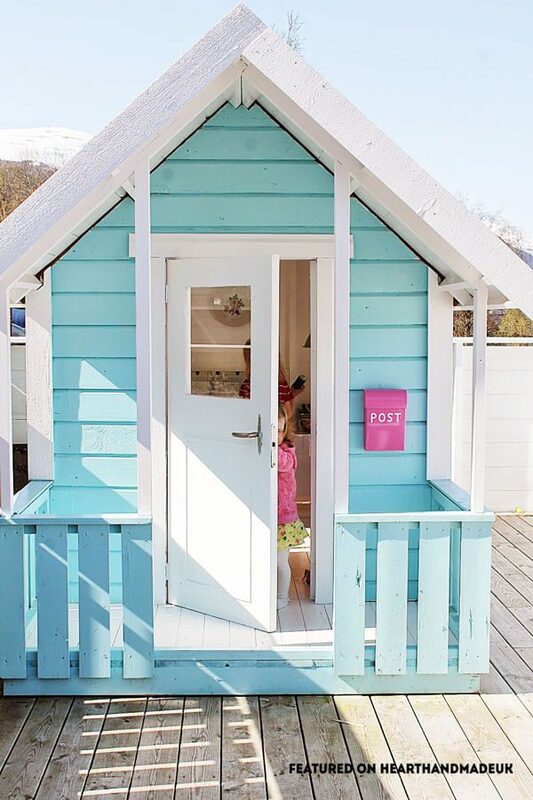 Oh my gosh, if you were in need of pastel shed color ideas then you must be in heaven! 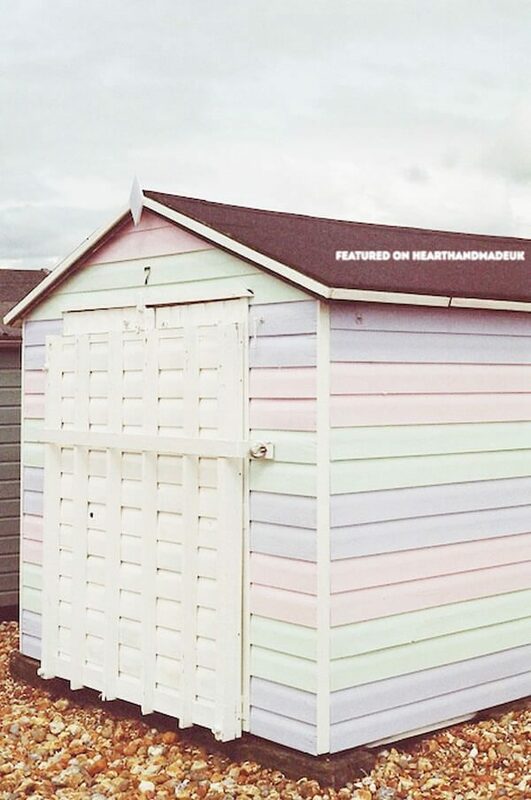 As soon as I found this pastel beach hut on ladybird likes, I couldn’t believe it! I love the idea of painting single panels (well, in two’s, but you know what I mean). Especially in mint , purple and pink pastel shades!! I’ve featured this glorious shed before! The inside is so beautifully decorated with white wicker furniture , floral cushions , and even a chandelier ! I want to buy all the baskets that are hidden under the white wicker seat, the floral curtains , the lanterns hanging from the door , those pretty pink floral wellies and the bistro set for the garden ! And this one! It’s gorgeous too. I absolutely love this floral blind . Both of these sheds were found via house to home. This little play shed is one of my absolute favorite things, ever. The painted post box looks fabulous attached just outside. These little girls are so lucky! Via huset ved fjorden. 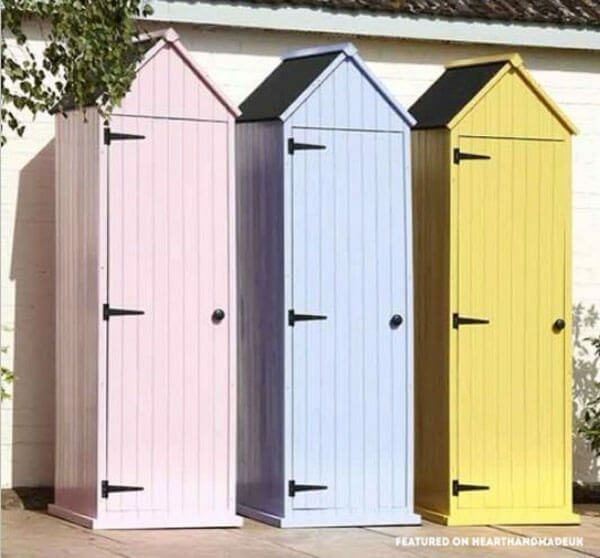 These pastel tool sheds are available to buy! Shed’s aren’t the only thing that I drool over, I’m a giant fan of amazing pastel caravans too! Yeah.. I know… I want one too. 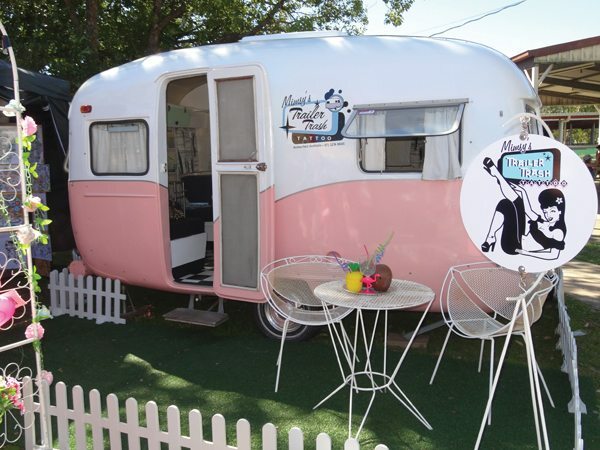 You can click on that caravan to go and drool over some more pastel caravans! ++Get Your Dream Balcony Garden! Pretty Pastel Furniture Updates For Your Garden! 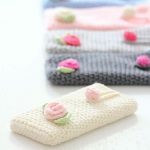 « How To Make A Blind – The Super Simple Way! I love these little pastel houses. It’s like a dream because where I live there is no place for one of these gorgeous houses. 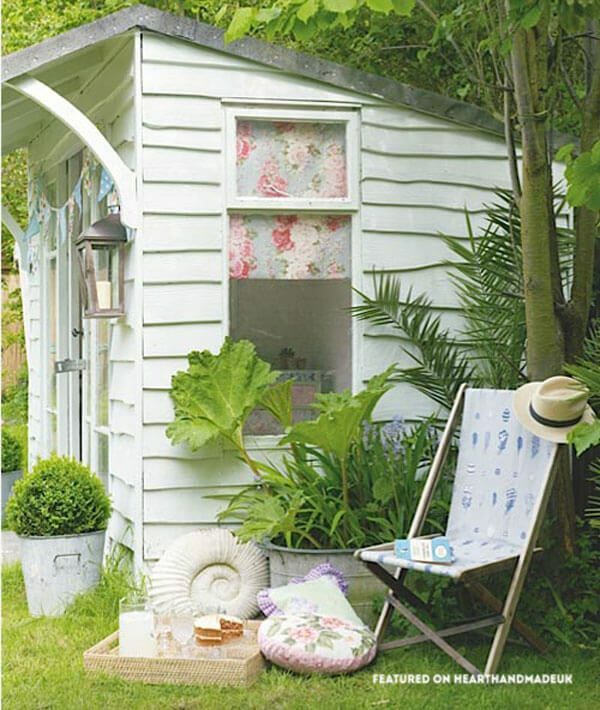 These pictures of gorgeous sheds and huts were just what i needed to inspire me to tackle my slightly neglected garden. Especially the one where you can see washing on the line! I’m not keen on too much staging and the washing makes it look like part of real family life. I just can’t choose a favorite, I love them all! I’m in need of a great tool shed and I’m currently racking my brain on how I could make look nice at the same time. Thanks for the ideas! Ok I know have Shed envy! I want one! These are adorable. So happy to find your blog at 2 cup tuesday! What a fun way to brighten up the backyard altogether. I am pinning this for a dream project! Can’t possibly choose a favourite, it’s like Sophie’s Choice! The 3 little sheds in a row are pretty fab though! How beautiful! I especially love the mint green. We’re putting one in this summer, so this is perfect timing for great decorating ideas! Thanks! I love these pastel sheds and thanks for sharing them at the Say G’day party and for your support! 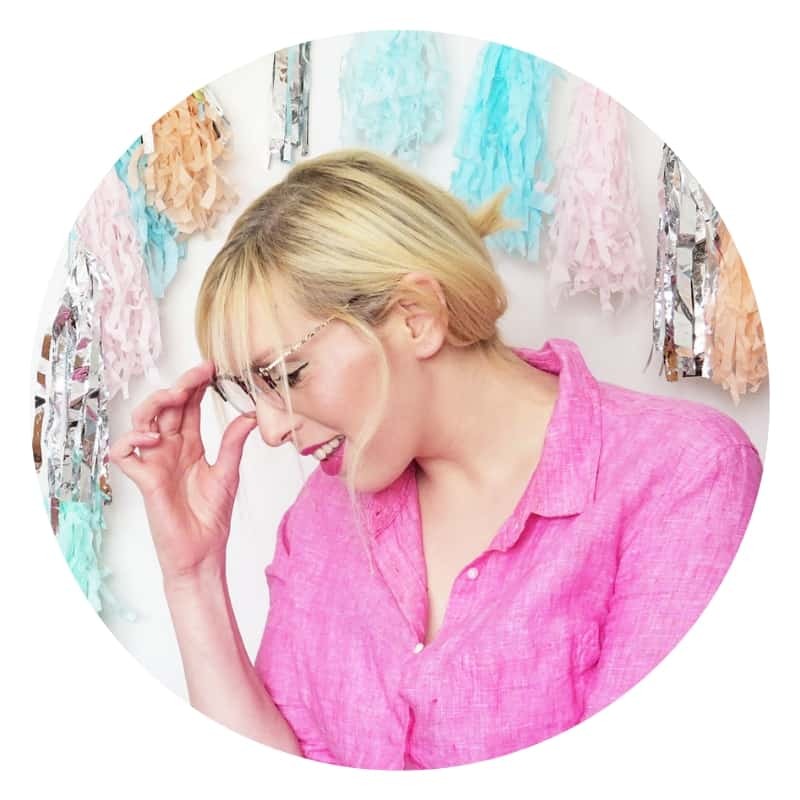 I have pinned all of your submissions this week and look forward to seeing you next week! Even as adult women, don’t we all still want a “playhouse”? Now, after seeing your post, I have shed-envy. Beautiful colors and designs! 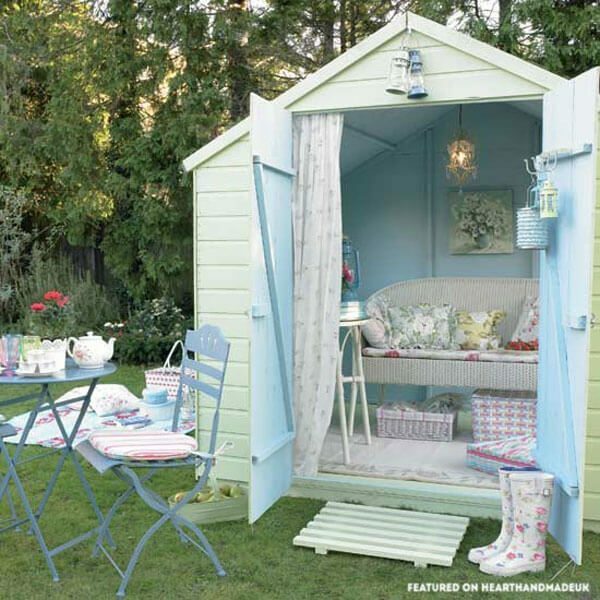 You have put together their cutest sheds, it is so fun what can be created for a little “my space” I love all the ideas! 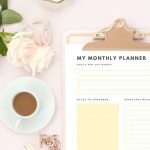 Thank you for sharing and stopping by Friday Features this week! 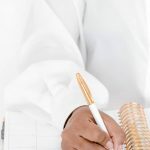 Pinned and will be featured 5/19 so be sure to stop back by next week! They are all just too cute! I don’t want to choose! 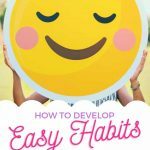 How To Create Easy Habits And Change Your Life For The Better!